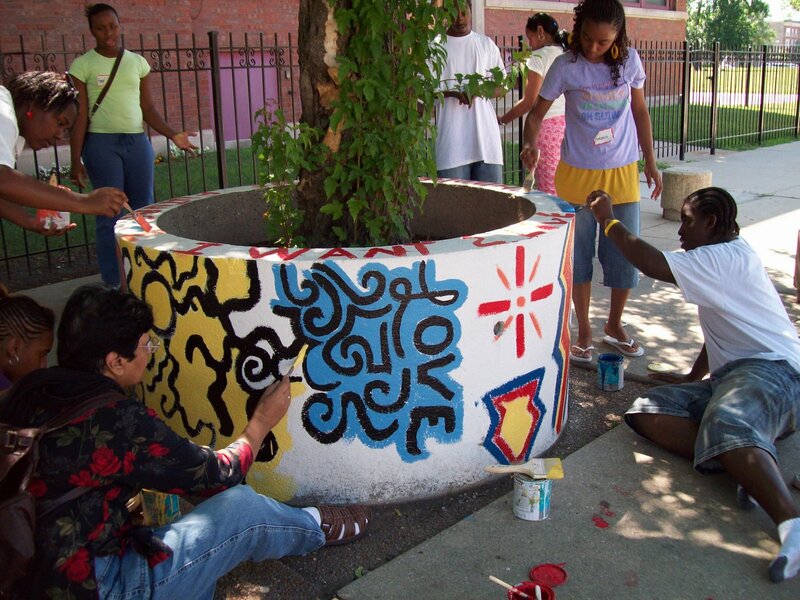 Woodlawn Youth Solutions is a project that develops leadership skills in youth through public art and beautification. WYS is transforming the planters at 62nd and Ingelside into community markers by redesigning, replanting, and relocating them with prominent community groups. They will be beautiful, colorful, and Woodlawn-specific, serving as a marker of community involvement for all those who adopt them. A weekly update for the project will be featured on this website. This project is being organized by Christ Way M.B. Church, architreasures, Brickyard Garden, the Office of Alderman Willie B. Cochran (20th Ward), and the Civic Knowledge Project at the University of Chicago. During the first week of the project, the young adults were introduced to the work that they would face over the next six weeks. After researching the history of the Woodlawn neighborhood and participating in discussions on the meaning and importance of Woodlawn, the teens took a trip to view the abandoned planters at their location on 62nd and Ingleside. Some of the sentiments expressed when looking at the condition of the planters were centered around their poor condition and seeming uselessness. However, when asked to describe potential futures for the planters, they came up with creative ideas that showed their vision for a new future for Woodlawn, for better planters and a greater community. Later in the week, they were able to express these ideas on the Woodlawn Youth Solutions main blog. In addition to this outlet, the young workers created their own blogs which can be used for entries discussing the project and related topics. Later in the week, the teens also took a trip to the Smart Museum of Art in Hyde Park to look at samples of community themed collections in order to form a better understanding of the artwork they would be creating in the upcoming weeks. Eager to get their hands dirty, the young workers began to work on designs for a Woodlawn logo that would be unique to their community, express their understanding of Woodlawn and be put on all the planters as a point for their transformation into community markers. The final product was the result of putting together ideas from several of the individual sketches the teens made of their own Woodlawn logos. 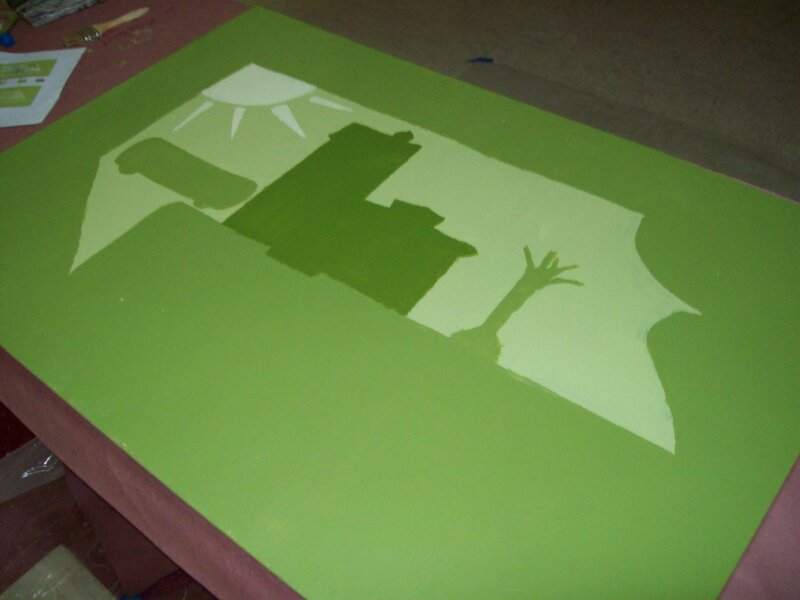 In addition to finalizing the design for the logo, the teens began to learn stenciling techniques and to paint maquettes of the planters. This part of the design process was meant to provide visual examples of future work and also provide practice for working on the actual planters. The latest steps in the design process were accompanied by trips around Woodlawn, during which the participants took pictures of buildings, plants and other neighborhood objects that would later become stencils for the painting process of the planters. Some students also had the opportunity to present the project's plan at the Alderman's office in order to secure his support and clarify the project's strategy. In order to get a better understanding of community unification, Woodlawn Youth Solutions visited the Field Museum where they watched a presentation focused on different types of community expression through art. The teens were given a chance to enter the museum's Maiori meeting house, which is a clear example of purposeful art that represents a specific community. Hopefully, this new information will prove useful in the process of designing art that will connect the citizens of Woodlawn. In continuation of a busy week, the teens were visited by Arthur L. Jackson, the pastor of Holy Trinity Church, who spoke about community leadership and responsibility. By the end of week three, six organizations agreed to adopt planters. This progress was made by several levels of community outreach including the creation of applications and agreement forms by the participants. Several groups discussed the important commitments that an adopting organization must be accountable for in possession of a planter. Some of these points were an ability to provide long term care for the paint, watching for graffiti and watering the plants. Unfortunately, the teens were forced to address the issue of potential vandalism of their artwork, which will hopefully become less of an issue as the process continues and their work is respected within the Woodlawn neighborhood. In addition to community outreach, the young adults were part of the Advisory Committee meeting during which members of the Advisory Board for the project discussed its progress. While some students spoke, other painted some of the planters on 62nd and Ingleside as practice and rough samples of future work. The young workers also continued to prepare for painting the planters by creating planter size stencils of the Woodlawn logo which will be put on all of the community markers. As we waited for the Alderman's office to sandblast and move the planters to their final locations around Woodlawn, we practiced the stenciling techniques necessary for painting the future community markers. The teens painted and stenciled the Woodlawn logo onto wooden panels for practice, some of which may be used for future endeavors. The final color scheme was green monochrome, which creates a simple, but classy look for the community markers, which can be seen at various locations in Woodlawn by the end of the project. By the end of the week, the Alderman's office began the sandblasting process of the planters and committed to having them moved by the Tuesday of week 5. After all of this is done, the young workers will be able to get started with the actual painting. So the planters were moved on Tuesday and we entered the final processes of painting and planting. On Wednesday, a group of volunteers from Cushman and Wakefield came to help us fill each of the seven planters with soil for the plants. After a long day of lifting dirt and teamwork, most of the planters were completely filled and the end of the project started to come into sight. With the planters filled with dirt, we were able to begin the painting stage of the project. Using layered stencils made weeks earlier, we were able to paint on the Woodlawn logo and a "You Are Here" map labeling the locations of all the planters around Woodlawn onto the transforming community markers. And thanks to the help of the sun in drying the paint, we able to finish the artwork on all of the painters by the end of the week. Now all we need is a sign painter to help us with the customized text we will be putting on the planters and some plants to make these community markers complete. And here we are at the end of the project. After six weeks of research, teamwork, dealing with obstacles and anticipation, we have finally completed our summer project. The young workers, with the help of many volunteers, supervisors, adopting organizations and other important contributors to the project, have completed the transformation of abandoned planters into beautiful community markers for Woodlawn. Decorated in a green monochromatic color scheme, the planters feature the newly created Woodlawn logo designed by the teens, a "You Are Here" map and text naming the adopting organization and their motto. It has been a very busy six weeks, but at the end of it all, we got the job done well. We hope that the influence of this project does not end with the completion of these community markers and we believe that this summer was only the beginning of long term community effort to improve our neighborhood.